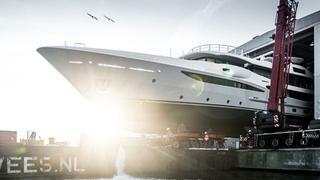 Dutch yard Amels has launched the 23rd model in its Amels 180 Limited Editions range, which has been named Papa. 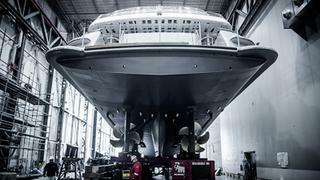 The yacht, which is scheduled for a spring delivery, marks the yard's first superyacht launch of 2019. 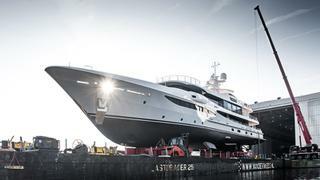 The owner, who was represented by Burgess when the yacht was sold in September 2018, has taken advantage of the option to customise the 55 metre yacht by creating a bespoke colour scheme in collaboration with the Amels in-house design team and exterior designer Tim Heywood. The customised interior design meanwhile will be handled by Laura Sessa. Standout features of the Amels 180 include a 190 square metre sun deck, bridge deck sky lounge and main deck owner’s suite, complete with a folding balcony. Accommodation on the Limited Editions 180 is for 10 guests split across five staterooms, while the crew quarters allow for a staff of up to 12. Amels previously revealed that the 24th and 25th models in other Limited Editions 180 series are already underway, with scheduled deliveries of 2019 and 2020. Speaking about the build, Papa’s captain Paul Bessant commended Amels' “teamwork”, revealing there had been positive relationships between the crew and project managers. “You feel very included, you feel that you really are part of the process from the beginning to the launch,” he said. “It’s been a pleasure working with the owner’s team to customise this yacht and the entire Amels team is working hard to achieve another on-time and on-budget Limited Editions delivery next year,” she added.